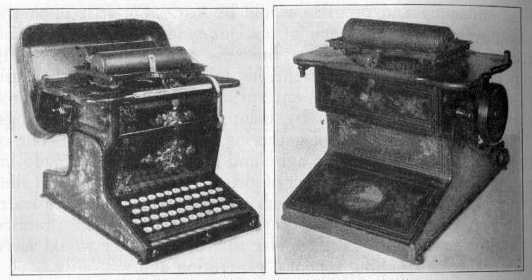 The typewriter on the left is a Remington built specially for the Philadelphia Centennial Exposition. The machine on the right is (supposedly) MT's first typewriter, also an early Remington. In the autobiographical dictations, MT boasted that "I was the first person in the world that ever had a telephone in his house" and that "I was the first person in the world to apply the typemachine to literature." He started typing occasional letters on the machine in 1874, and by all accounts was the first author ever to have a manuscript typed. 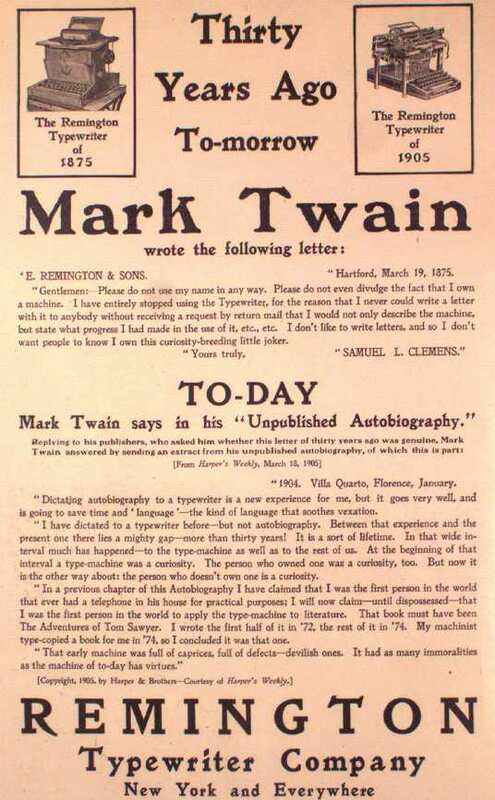 In his autobiographical dictations he remembered it as the manuscript of Tom Sawyer (1874), but according to typewriter historian Darryl Rehr, the book was Life on the Mississippi (1882), and the machine was a Remington No. 2. When in 1905 an installment of his autobiography mentioning his experience with a typewriter appeared in The North American Review, Remington quickly seized the opportunity to use his remarks as a plug for their machine. The ad below appeared in Harper's.